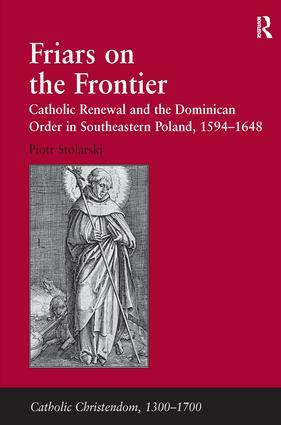 Focusing on the Dominican Order's activities in southeastern Poland from the canonisation of the Polish Dominican St Hyacinth (1594) to the outbreak of Bogdan Chmielnicki's Cossack revolt (1648-54) this book reveals the renovation and popularity of the pre-existing Mendicant culture of piety in the period following the Council of Trent (1545-64). In so doing, it questions both western and Polish scholarship regarding the role of the Society of Jesus, and the changes within Catholicism associated with it across Europe in the early modern period. By grounding the rivalry between Dominicans and Jesuits in patronage, politics, preaching, and the practices of piety, the study provides a holistic explanation of the reasons for Dominican expansion, the ways in which Catholicisation proceeded in a consensual political system, and suggests a corrective to the long-standing Jesuit-centred model of religious renewal. Whilst engaging with existing research regarding the post-Reformation formation of religious denominations, the book significantly expands the debate by stressing the friars' continuity with the medieval past, and demonstrating their importance in the articulation of Catholic-noble identity. Consequently, the monograph opens up new vistas on the history of the Counter-Reformation, Polish-Lithuanian noble identity, and the nature of religious renewal in a multi-ethnic and multi-denominational state. Dr Piotr Stolarski is a Catholic historian and poet. He studied at the universities of London and Aberdeen.